Michelle Malkin has an update on her cousin, Marizela Perez, who has been missing for two months. Today is her 19th birthday. Unfortunately, there is no news or leads. Michelle discloses that the family has not received cooperation from Jack in the Box Corporation for suveillance video at one of its locations, nor from Google in preserving search and other data. Give them a polite contact at the links. Hopefully there will be a good ending to this. And on the 75th episode of the Saturday Night Card Game, we again ponder how we have reached the point where words or expressions which have no connection to race have become a tool by which the race card players stalk Republicans, conservatives and Tea Party supporters. The latest example is the nontroversy over Mitt Romney's play of the common phrase to "hang an albatross around his neck." That metaphor was used frequently during the 2008 campaign as commenters throughout the left-blogosphere wanted Democrats to hang George W. Bush around John McCain's neck. You can guess the rest, media buzz and cries of racism because in the games of the race card players, hanging the misery index around Obama's neck or hanging Obama with it, just like it was hung around Carter's neck, is exactly the same thing as saying "let's lynch the black guy." HuffPo: "Mitt Romney's camp is attempting to do damage control after the presidential aspirant made controversial remarks in criticizing President Barack Obama during a stop in New Hampshire on Friday night. Boston Globe: Romney clarifies as he proposes to 'hang' Obama with misery index. Raw Story: "In a speech at the pro-GOP Americans for Prosperity dinner, former Massachusetts governor and contender for the GOP presidential nomination Mitt Romney said he would "hang" Obama, then immediately realized his gaffe and tried to smooth over his mistake." Politico: "Any reference to hanging — however unintentional — would be especially loaded in a campaign against the country's first black president, as Romney apparently recognized." Daily News: "Mitt Romney scrambled to do some damage control after he suggested it was time to "hang" President Obama in a speech in New Hampshire Friday night. What lunacy. It's become a mind control game. These people are not addressing actual racism, they're just playing word games and gotcha. Romney should not be apologizing. He said nothing wrong. He was not suggesting a literal hanging of Obama and he did not use racial terminology. But recognizing the way in which race-neutral words would be twisted against him, Romney clarified the remarks on the spot. There is no story here. No offense intended to capitalists, or to Obama. The final components of Gov. Mitch Daniels’ education reform package – a massive new voucher program and charter school expansion – cleared the Indiana House on Wednesday and could be law within days with just the stroke of a pen. Two other bills affecting Indiana education have already passed – one reducing collective bargaining rights for teachers and another tying teacher pay to student performance. A state will a voucher structure in place will be a great boon for those in the fight for school choice. The evidence against the status quo is overwhelming, but the example of a statewide solution would really bring things home. I applaud Governor Daniels and hope to see Chris Christie emulate him. Think Progress, the Democratic messaging website run by John Podesta of the Center for American Progress, has been a frequent focus here for its outlandish race-card playing and other antics. This week Think Progress hit a new low, when it ran a blog post mocking the politics of southern states which were hit by tornadoes, using the devastation as an excuse both to push a global warming agenda and to take a swipe at the conservative politics of the region. It was in many ways Think Progress' Wonkette moment. US meteorologists warned Thursday it would be a mistake to blame climate change for a seeming increase in tornadoes in the wake of deadly storms that have ripped through the US south. "If you look at the past 60 years of data, the number of tornadoes is increasing significantly, but it's agreed upon by the tornado community that it's not a real increase," said Grady Dixon, assistant professor of meteorology and climatology at Mississippi State University. "It's having to do with better (weather tracking) technology, more population, the fact that the population is better educated and more aware. So we're seeing them more often," Dixon said. But he said it would be "a terrible mistake" to relate the up-tick to climate change. 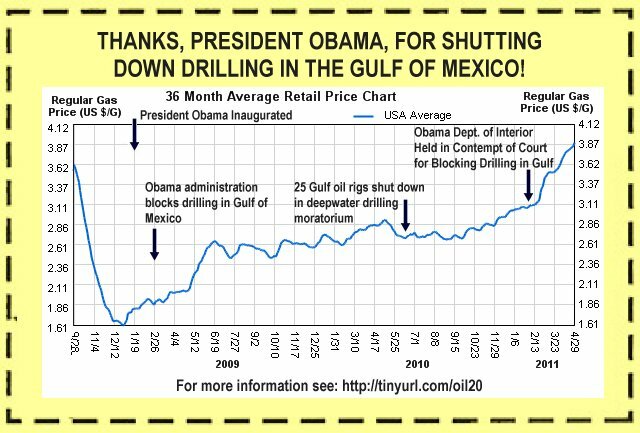 Lacking a scientific basis for the crude political swipe, Think Progress did what Wonkette originally did, double-down. The author of the original post ran a third post the next day trying to justify his original posts, and Think Progress' lead blogger, Matthew Yglesias (one of the first bloggers to make a connection between the Sarah Palin electoral map and the Gabriell Giffords shooting), came to his defense in response to a critical post by Tabitha Hale. The outrage at the Think Progress post will not last, unlike the outrage directed at Wonkette. In part, it's because there is no one to whom to complain. Think Progress, flush with cash from big Democratic donors, has no advertisers. But in part it's because we expect so much less from Think Progress than from Wonkette. Well, he keeps saying we need to emulate China. The controversy was not the protest, but that the White House communications team threatened to suspended the reporter who took the videotape, because multimedia coverage of Obama's fundraiser was not permitted. The White House now denies the threat, but the San Francisco Chronicle calls the White House statement a "pants on fire" lie. I wonder why he doesn't like secret taping of fundraisers? 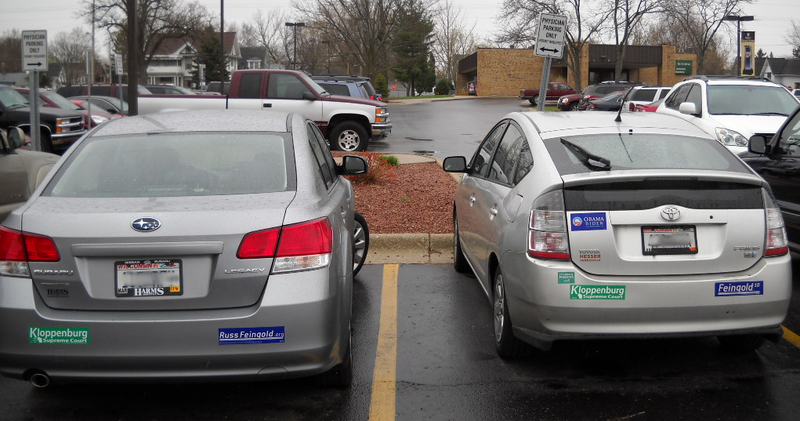 Thanks to Steve Burri for sending this photo he took in the physicians' parking area at a local Wisconsin hospital. How Long Before DOJ Forms "Gas Pump Defacing" Task Force? "Push-polling" is where a type of campaign tactic where, under the guise of a poll, misleading or inflammatory questions are asked about an opposing candidate. The point of the push-poll is to persuade the person being polled as to a candidate or issue, rather than actually soliciting opinions. A similar tactic is being used by the Wisconsin Democratic Party to try to get people who signed petitions to recall Democratic state Senator Robert Wirch to say that they were deceived or didn't know what they were signing. The tactic is not a push-poll, but a call seeking to verify petition signatures in which suggestive statements are made which would call into question the signature. "The reason we're calling is there were reports from people in the community that out of state paid circulators were misleading people about what they were being asked to sign and we have reports of them tricking voters into thinking they were signing a petition, say at a nearby shopping mall, or providing them with misleading information, so all we were calling was to find out is if you did intend to sign the petition to remove Democratic Senator Wirch from office." Before the audio started, the caller did identify herself as calling from the Democratic Party. According to the person who provided me with the audio, the number which showed up on the caller i.d. was the number used by the group fighting the recall on behalf of Wirch. The point of the introduction is to suggest that the petition signer may have been deceived, and that the phone call merely is a form of verification. This is not an attempt to solicit facts, but to suggest facts to the person who signed the petition. At no part of the call does the caller indicate she not only is calling for the Democratic Party, she is working for the Wirch campaign as part of efforts to throw out the recall petition. The Recall Wirch group which organized the petition drive has issued a press release objecting to these tactics, which apparently have taken place in other districts as well. There certainly is nothing wrong with verifying signatures. That's what the process is about. But it must be very unsettling to people, in light of the death threats and intimidation tactics employed by opponents of Gov. Scott Walker, to receive a phone call at home when phone numbers were not part of the petition. In normal times perhaps a phone call at home would not be viewed as intimidation, but considering what has happened in Wisconsin, people who receive such calls must be worried. Additionally, the phone call is deceptive, in that it suggests at the start that there has been a problem reported "by people in the community" with deceptive petition practices. In fact, other than a few isolated incidents, there has not been any evidence made public of widespread problems with the over 18,000 signatures (only 13,537). And the call was not made as a response to complaints, but as part of a pre-planned attack on the petitions. This is an attempt to create the appearance of problems with the Recall Wirch petitions, not to document actual pre-existing problems. Today it was officially announced that Bloomberg will have a new editorial component. Bloomberg View will be a comprehensive opinion resource and, I have to say, I'm really impressed by their lineup. Postrel and a few others will be on my GoogleReader, but I'm even looking forward to some of the people I doubt I will agree with (Gill, Cohan, etc.). Overall, I applaud the choices Bloomberg made. I'm looking forward to reading this new project! Which names did you like to see? ...it's absurd that the entire world is hanging on the words of Ben Bernanke. He has been wrong at literally every major point in the housing bubble and then crisis. So why should we care about his predictions concerning the economy or his recommendations for how to end the slump? because I'm not sure I could have controlled myself. Spotted by reader Joseph in Woodstock, NY, this last weekend. "God is just rewarding Repubs by bringing them home." Huff-Watch is collecting reactions from Huffington Post commenters about the tornadoes that killed over 250 people, mostly in the South, including the comment in the headline above. It is worth taking a look at the post below, by the same person who did My Rebuttal to a Progressive, the best rant since Rick Santelli.. The post is 10 Rules for Liberty Guerrillas. "It is important to maintain a belief in final victory. Morale is everything." I was absent from the posting cycle on the 17th and I gave a few hints in this direction. 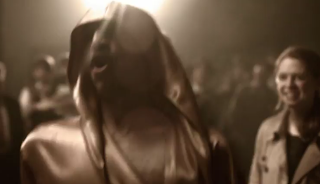 Indeed, I made it to the final cut... sort of... in the background at 2:07. 2. I had the pleasure of seeing Michael Barone speak last night at Cornell. I enjoy Barone's columns, but to watch him speak is to witness another plane of his genius. His mind is armed with an artillery of facts, figures, and historical observations that were a true delight to see him weave together. And it wasn't just his speech that impressed me (the Democrats read into 2008 wrong, it was an anti-incumbent backlash, not a thirst for big government that elected Obama), it was the fact that he knew about the small centrally-planned facet of my hometown, Fair Lawn, NJ, which he cited when I introduced myself to him. Did anyone like the Keynes v. Hayek video? Has anyone else seen Michael Barone speak? As if Part 1 were not enough. In the week ending April 23, the advance figure for seasonally adjusted initial claims was 429,000, an increase of 25,000 from the previous week's revised figure of 404,000. The 4-week moving average was 408,500, an increase of 9,250 from the previous week's revised average of 399,250. And here's how the MSM is headlining it, via Reuters: Jobless claims jump in latest week. Economic growth slowed to a crawl in the first three months of the year as a spike in gasoline, higher overall inflation and continued weakness in the housing market all took a toll on the recovery. 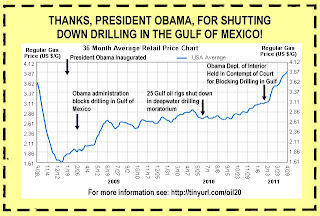 Obama no longer has that "silly" distraction to wave around anymore. So I'm predicting little if any spike for Obama from finally releasing a document all of us have had to release at some point in our lives. 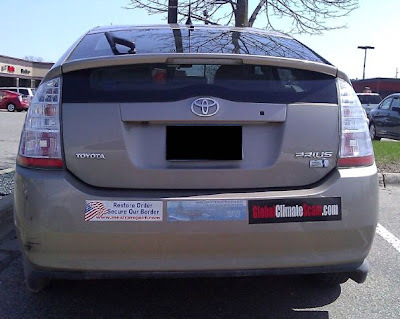 Spotted by reader Patrick in Eagan, Minnesota. 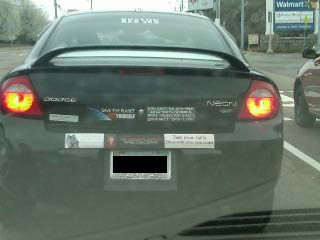 Supporting the Navy is one thing, but a climate change denier? 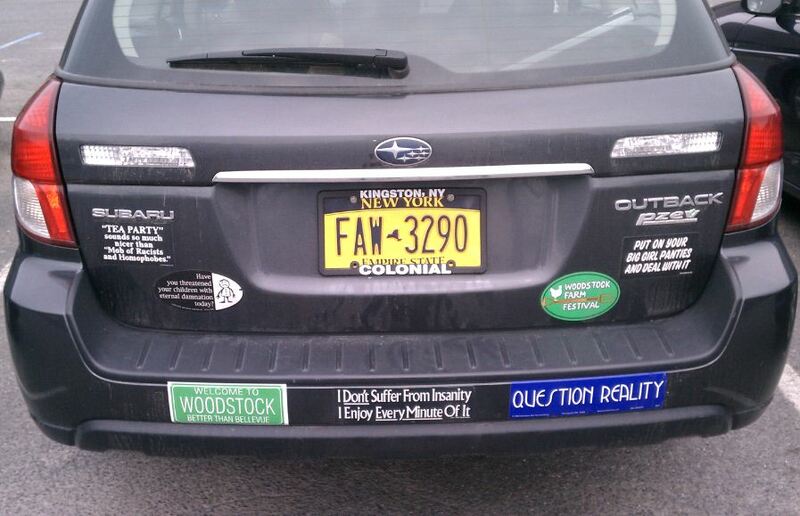 And you call yourself a Prius. A motion has been filed in California federal District Court seeking to vacate former Chief Judge Vaughn Walker's ruling holding that Prop. 8 violated the United States Constitution. A copy of the motion is here. As a matter of routine, the movants selected a hearing date for the motion in July before Chief Judge James Ware, who replaced Judge Walker on the case. The motion argues that Judge Walker's recent announcement that he has been in a committed homosexual relationship for the past 8 years gave Judge Walker an interest in the outcome of the Prop. 8 ruling. The movants argue that such interest combined with evidence of actual bias, including Judge Walker's highly unusual procedural rulings in the trial whcih led among other things to a rare rebuke by the U.S. Supreme Court, demonstrated a conflict of interest which should have led Judge Walker to recuse himself from the case. The motion is low percentage, in my estimation. Nonetheless, the motion presents important issues which need to be addressed promptly because the outcome of the motion could affect pending appellate proceedings in the California Supreme Court and 9th Circuit, so Judge Ware moved the hearing up from July to mid-June. This is rank bigotry on the part of Judge Ware, and can only be justified by the federal court system’s consideration of gay people as second-class citizens. It is shameless prejudice. No heterosexual judge would be held to any similar standard regarding her own long-term, committed relationship. No plaintiff would dare question the bona fides of a straight judge. Gays are second-class in federal court and in America; Judge James Ware just proved the entire point of Perry. And no chief judge would consider such a motion about a heterosexual judge, nor would he grant a hearing and request briefs on the topic. It is absurd on its face and should be rejected by the federal court system. Judge Ware should be sanctioned for allowing such rank bigotry a place in his courtroom. He should certainly remove himself from any further deliberations regarding the Perry case, as he’s shown himself to hold bigotry in high enough esteem to hear its arguments about a colleague. It’s shameful and it shouldn’t be tolerated. The comments to Partridge's post are even more hyperventilated. Word to Teddy. Deciding motions is what Judges do. The fact that a Judge allows a hearing on a motion, and expedites consideration, does not reflect agreement with the motion. If you really want Judge Ware off the case, gets lawyers to make the argument for you. I think I know a law firm which will do it for free, because things have been slow lately in its Gitmo detainee practice group. Did Basic Polling Interpretation Errors Drive Obama To Mishandle The Birth Certificate Issue? I have generally believed that Obama did not release his birth certificate because he thought that the birther issue made some of his opponents look foolish. So long as the birther issue was politically beneficial, there was no reason to put it to rest. But, true conspiracy theorists notwithstanding, now he has. Why? That is the question of the day. Does he fear Trump qua Trump? Doubtful. Trump's polling is pretty dismal at this juncture. It's Palin dismal (Don't get me wrong, I like Sarah Palin, but bad numbers are bad numbers). Did he think the public was starting to buy the birther line in a way that was particularly harmful to him? Perhaps. If so, he may have been driven to a political blunder by a collection of basic errors in polling interpretation. As Nate Silver points out, while Gallup found that only 38% of Americans believe Obama was definitely born in the US, only 43% of Americans think Trump (about whom there is no active birther movement) was definitely born in the US. A number of issues may be artificially inflating this high degree of uncertainty. First of all, when people are asked questions about political figures, the act of asking the question is itself a suggestion that a meaningful controversy exists about the subject. Second, people are hesitant to express absolute certainty, especially about matters they know little about or do not regularly concern themselves with. Finally, people also don't always answer the question the pollster thinks they are asking, especially when they know few actual facts about the issue in question. Polling non-obvious facts about controversial people will often result in respondents simply taking the opportunity to express positive or negative affect towards the person in question. The number of Americans who think Obama was definitely born abroad (24%) is significantly greater than the number who think Trump was born abroad (7%), but it seems unlikely that once the sources of inflation are removed, there are all that many Americans left who are serious birthers and are the sort of people who would ever consider voting for Obama anyway. Taken together, these theoretical flaws and Gallup's "Trump birther" pseudo-control question raise significant doubts as to the threat posed to Obama by birtherism. Had Obama waited until the election, he may have been able to strike a serious blow against his opponent and other Republicans by shooting down this conspiracy in a spectacular fashion, but instead, he did us a great favor by squandering this advantage. Obama’s strengths and weaknesses come from his high degree of “integrative complexity” — his ability to keep multiple variables and trade-offs in mind simultaneously. The integratively simple thinker — say, George W. Bush — has one universal organizing principle that dominates all others, while the integratively complex thinker — Obama — balances many competing goals. Philip Tetlock, a professor of psychology with the University of Pennsylvania’s Wharton School of Business, found that politicians on the center-left (where Obama dwells) tend to have the highest degree of integrative complexity, followed by politicians on the center-right. Politicians on the far left and far right are the most simple. Oh, I get it, inconsistency and backing-out of campaign promises are symptoms of genius, not rough political polish and a lack of principle! I'm sure there's no correlation between George Bush's experience manifesting in straightforward goals and Barack Obama's "experience" waxing philosophical in a classroom for a few dozen years manifesting in insipid policies that fail upon application. America likes great communicators who keep promises, not displaced political science professors. Why? Because they work. I know there is no logical way David Prosser could lose 7316 votes in the recount. The state Supreme Court recount got off to a wobbly start here Wednesday. After more than a half-hour of meticulous instructions and ground rules relayed by Waukesha County's chief canvasser, retired Judge Robert G. Mawdsley, questions were raised about the very first bag of ballots to be counted, from the Town of Brookfield. As canvassers and tabulators compared a numbered seal on a bag with the number recorded for that bag by a town election inspector who prepared the paperwork on election night, the numbers didn't match. "What a great way to start," one official tabulator said. Observers from the campaigns of Justice David Prosser and JoAnne Kloppenburg both agreed, however, that the error seemed to be in the inspector's use of a "2" instead of a "3." Numbers on the sealing tag and on the bag did match. Both sides and the Board of Canvassers agreed that the bag should be opened and the votes counted. I hope the Republicans in Wisconsin are not taking anything for granted. 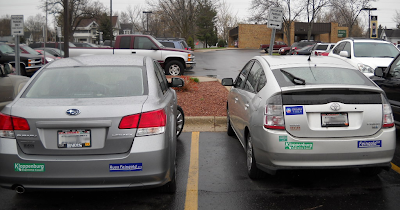 Check every car trunk before the vehicle gets within 400 feet of a recount location. Why did he wait so long, almost three years after Clinton supporters first claimed Obama was born abroad, for Obama to release the original documentation? There certainly were political strategies involved. But that cannot explain it all. It was Obama's enormous ego. Challenged, he sought to control the dialogue and the flow of information, and the harder people pushed, the more he dug in. It was only when his reelection was threatened -- which would be an even bigger blow to his ego -- that he took the easy step of sending a letter requesting a certified copy of the original document. And when he finally was forced to release it, he laughed that is was all so silly. Digging in, obstinacy, control of the message, and an arrogant dismissive attitude, it's the hallmark of this administration. And it's all about him. 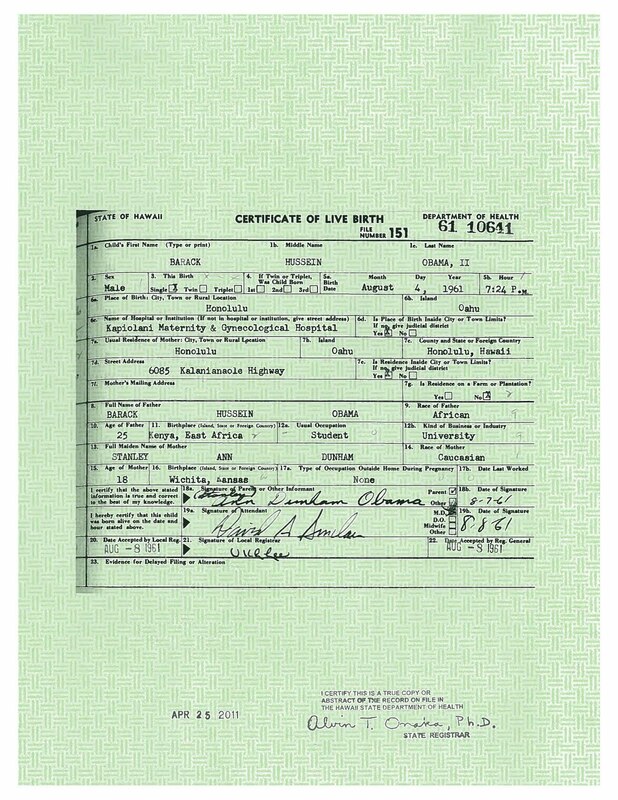 So much for our media, which has been telling us -- contrary to the actual law as I explained previously-- that Obama could not obtain original documents of his own birth records. 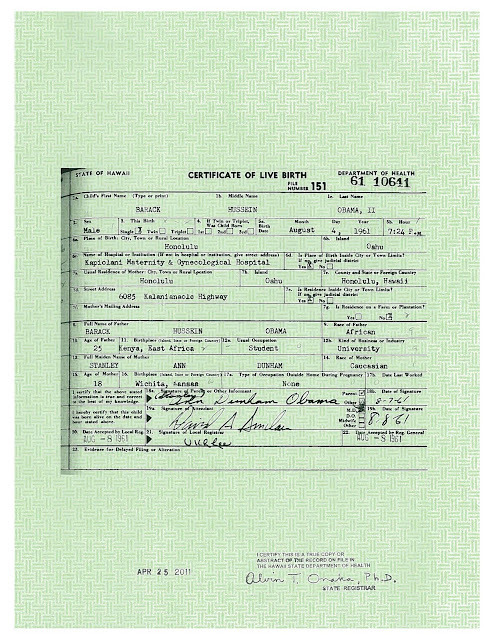 Succumbing to the realization -- which I also predicted -- that the "Birther" strategy was failing, the White House has purported to release this morning a "long form" birth certificate. It looks to me like a 1961 version of the short form Certificate of Live Birth. Here's the link to the White House page and the document, an image of which is below. The document goes a long way, if not completely, towards quieting the issue. But the ease with which Obama was able to get the document leads one to wonder why he resisted so long. It was only when the Obama campaign saw the issue developing into a strategic nightmare that Obama took the simple and easy step of releasing an original document. This also raises issues as to why the media repeatedly has told us that Obama was not able to obtain original documentation when clearly he was able to do so. While the Obama campaign certainly will spin this as some sort of victory, it came at a high price to Obama in the polls. Specifically, tell me about Paul Ryan as a presidential candidate, now that there are murmurings that he may jump in. Why not? Republicans are going to have to defend the Ryan plan, who better to do it than Ryan. Someone who conveys a seriousness about policy without being a Washington, D.C. insider, who would make mincemeat of a teleprompterless Barack Obama, someone who is willing to face down even the astroturfed crowds sent by Americans United for Change for videotaping by Think Progress. When Jim Newell of Gawker, formerly of Wonkette, is baiting Ryan to run, maybe we're onto something. Bring on the Gawker and Wonkette crowd, and let's have at it. And the disruption at Ryan's event yesterday, it was caused by SEIU and Teamster officials. So Tell Me About Mitch Daniels, Tim Pawlenty and Mike Huckabee.